Wis. Stat. 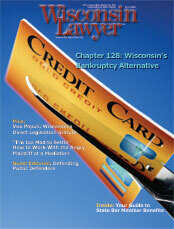 chapter 128 is an old, but still little-known alternative to bankruptcy that attorneys should explore as the first option for their clients who wish to repay debt and need the help of a structured plan to get back on their feet. Wisconsin’s Direct Legislation Statute, section 9.20, gives voters a direct voice in local matters and provides a procedure by which voters may compel local government to pass or put before the public for a popular vote a proposed ordinance or resolution. Read how it works. Understanding the causes of and sincerely and directly acknowledging a party’s feelings of anger and resentment, both before and during a mediation, can help the lawyers and mediator move a case toward resolution. Here’s how. The Office of Lawyer Regulation, an agency of the Wisconsin Supreme Court and component of the lawyer regulation system, assists the court in carrying out its constitutional responsibility to supervise the practice of law and protect the public from misconduct by lawyers. The Office of Lawyer Regulation has offices located at 110 E. Main St., Suite 315, Madison, WI 53703; toll-free (877) 315-6941. The full text of items summarized in this column can be viewed at www.wicourts.gov/olr. This issue of the magazine includes the latest member resources brochure. Take a few minutes to become familiar with, and then use, the benefits your dues dollars provide. The system is broken - a fair, impartial, and independent supreme court may soon be a thing of the past. It was serendipity when John McMullen, a former U.S. Navy JAG Corps lawyer, called Mary Lansing of the La Crosse office of Legal Action of Wisconsin (LAW), wanting to become involved with LAW as a volunteer lawyer. This column recognizes the efforts of Wisconsin lawyers who donate their time and professional skills to individuals with legal needs who are unable to pay for a lawyer and to projects serving those individuals. Some of the most unfair attacks on Justice Butler in the recent supreme court campaign targeted his former role as a public defender, with the message being that an attorney who serves as a public defender might be unfit to serve as a justice on the Wisconsin Supreme Court. This message is both false and dangerous to our system of justice. Most of us need to do our disaster planning in small steps; such planning is just too overwhelming to take on all at once. (Of course, if you are not a procrastinator and can scratch a project from your "to do" list in one swoop, be my guest.) The rest of us should start by thoughtfully considering our everyday procedures, with a view to what we would need most if the worst were to happen. Chief justice tells new lawyers, "Be lawyers of courage"
On April 23, 40 lawyers who passed the bar exam were admitted to practice in Wisconsin. The lawyers were welcomed by the Wisconsin Supreme Court justices, Board of Bar Examiners (BBE) Chair James A. Morrison, BBE Director John E. Kosobucki, and State Bar President Thomas Basting. How Would I Recover If My Office was Destroyed? I worry about keeping my practice going if disaster strikes and my files are destroyed. The "what ifs" are making me lose sleep - what if there's a fire, what if there's a burst water pipe, what if there's a tornado or a flood. What can I do now to protect my practice?